A Teamsters Local 727-represented member at Coca-Cola Niles received more than $5,000 in back pay after he was wrongfully denied workers’ compensation. 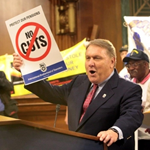 In a letter sent last week, Teamsters General President Jim Hoffa called on the trustees of the Central States Pension Fund to recall the proposal made to the Department of Treasury that calls for deep cuts. 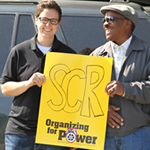 Teamsters Local 727 brought together SCR paratransit drivers on Oct. 7 for a cookout and organizing rally as the workers gain momentum in their quest to form a union. In the last nine months alone, Teamsters Local 727 representatives have successfully fought for the reinstatement of a dozen paratransit workers who were wrongfully fired. The union also has filed about 75 grievances.